Hawaiʻi congressional team honors UH delegation to the Smithsonian Folklife Festival in D.C.
At the nation's capitol, Hawaiʻi Community College's hālau Unukupukupu performs for the Hawaiʻi congressional delegation, Office of Hawaiian Affairs trustees, and UH President MRC Greenwood. The event was a Mahalo Reception for the hālau and the rest of UH's 80-member delegation to the Smithsonian Folklife Festival in Washington, DC. Nine UH Hilo faculty, staff and students are dancers in the hālau , including Drew Kapp (blue shirt), Ginger Hamilton (next to Drew in red), Tammy Tanaka (at right in hat with yellow band), and Gail Makuakane-Lundin (next to Tammy in long purple mu'umu'u). The University of Hawaiʻi has a huge presence at this year’s Smithsonian Folklife Festival in Washington, D.C., where students, faculty, staff and a supporting community are sharing their knowledge of agriculture, Hawaiian health and healing, aquaponics and other specialties with more than a million visitors from around the world. That hasn’t escaped Hawaiʻi’s congressional delegation, which, along with Governor Neil Abercrombie, hosted a mahalo reception for festival participants in the nation’s capitol on June 28. UH hula hālau chanted and danced, and Senator Daniel Akaka’s rendition of the Hawaiian Lullaby received resounding applause. “I’m so proud to be amongst you here from Hawaiʻi because you’re just one of 20 universities in this country that was invited to be part of the Smithsonian Folklife Festival,” Akaka said. Senior Senator Daniel Inouye expressed pride and support for the university’s work in reaching up to 1.5 million people on The National Mall. “The Hawaiʻi delegation is extremely proud of the work you’re doing and we’d like to welcome the 80 UH students and faculty members who have come here to show the rest of the world and the rest of the nation that we in Hawaiʻi are now number one,” Inouye said. “People on the mall coming by and they see what Hawaiʻi is, it is the only way we are going to get everyone to understand how special a place Hawaiʻi is, how wonderful aloha is and what it all means,” said U.S. Representative Colleen Hanabusa. Congressional leaders say a world stage like the Smithsonian Folklife Festival can only help boost Hawaiʻi’s tourism industry, spark and increase interest in continuing research in specialties like aquaponics, and raise the potential for millions of dollars in research grants. “There are a lot of people who are very interested in sustainability issues in terms of food and I think this is a revelation to them that there was a culture, that they protected the ʻaina,” said U.S. Representative Mazie Hirono. “I don’t know that there’s ever been a time when I’ve been prouder of the university and more conscious of the very special role that the University of Hawaiʻi plays here in the United States today,” said UH President M.R.C. Greenwood. Read more about UH Hilo’s participation in the festival. UH opens Smithsonian Folklife Festival in D.C. The University of Hawaiʻi led the opening of this year’s Smithsonian Folklife Festival in Washington, D.C., where hula hālau Unukupukupu from Hawaiʻi Community College, which includes dancers from UH Hilo, took the main stage and thrilled the international crowd. Then the hālau led UH President M.R.C. Greenwood, university administrators, students, faculty and community supporters as they all blew conch shells to signal the start of the long-awaited festival. The UH delegation then led 19 other public land-grant universities and colleges to the heart of the cultural festival. UH Hilo faculty, staff and student with pahu drums during opening ceremonies at the Smithsonian Folklife Festival in Washington, DC. (L-R) Tammy Tanaka, Drew Kapp, Keyrah Tejada, and Ginger Hamilton. Nine faculty, staff and students from UH Hilo are part of the 80-member UH delegation that will be showcasing the university and community in exhibits. In the video above, UH Hilo’s Gail Makuakāne-Lundin, executive assistant to the chancellor (0:28); and left to right, Tammy Tanaka, secretary to the associate dean, Office of Research, College of Pharmacy; Drew Kapp, instructor of geography; Keyrah Tejada, student; and Ginger Hamilton, director of the Minority Access & Achievement Program, are drumming in the opening ceremonies. “What we’re celebrating here in Washington is the value and the contributions of the indigenous people, as well as the impact of the modern research university and the combination of celebrating our past and heralding our future,” said Greenwood. More than a million people are expected to visit the Smithsonian Folklife Festival over the next two weeks. This report is adapted from a UH System News report. and learn more about UH Hilo’s representatives at the festival. Read more UH System News reports about UH at the Smithsonian festival. 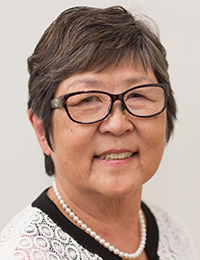 UH Hilo participates with UH System in Smithsonian Folklife Festival, Washington D.C. The University of Hawaiʻi is among 20 public land-grant universities to be featured in the Smithsonian Folklife Festival in Washington D.C. from June 27 to July 8, 2012. This year, the festival celebrates the 150th anniversary of the signing of the Morrill Act, which paved the way for higher education for rural and working class Americans. Nine faculty, staff and students from UH Hilo are part of the 80-member UH delegation that will be showcasing the university and community in exhibits that will be seen by more than a million people. In addition to Makuakāne-Lundin, UH Hilo representatives and dancers at the festival are Ginger Hamilton, director of the Minority Access & Achievement Program; Kainoa Ariola, interim director of Kīpuka Native Hawaiian Student Center; Drew Kapp, instructor of geography; and Tammy Tanaka, secretary to the associate dean, Office of Research, College of Pharmacy. UH Hilo students participating are Pele Kaio, Wahineaukai Mercado, Kahealani Wilcox, and Keyrah Tejada. The University of Hawaiʻi exhibits will feature traditional Hawaiian health and healing practices, a mini taro patch, non-instrument navigation, medicinal herb and organic farming and much more. Hawaiʻi Community College’s hālau Unukupukupu and the University of Hawaiʻi at Mānoa’s Tuahine Troup will also perform. UH Hilo’s ‘Imiloa Astronomy Center will give free screenings of ‘Imiloa’s new “Awesome Light” planetarium visual presentation at the Air and Space Museum’s Einstein Planetarium on June 28, July 4 and July 5. There also will be presentations on non-instrument navigation and the Hawaiian star compass chart by way-finding expert Kalepa “Chad” Baybayan of the voyaging canoe Hokule‘a. In the video above, Unukupukupu, a hula hālau from Hawaiʻi Community College, performs at the Library of Congress in Washington D.C. on June 26, 2012. 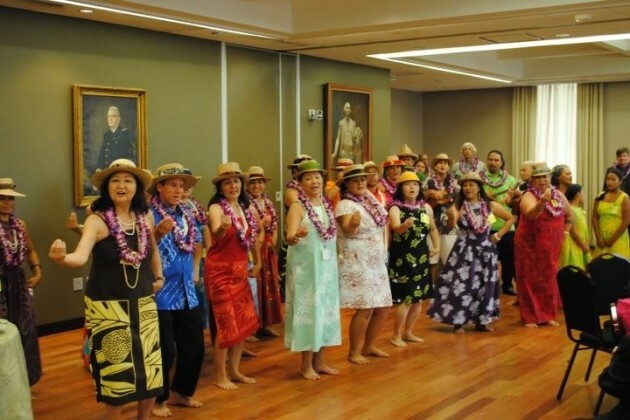 The hālau received a prestigious invitation from the American Folklife Center, part of a series aimed at promoting traditional, ethnic and regional music and dance that is homegrown in communities across the United States. Unukupukupu consists of 25 faculty members, staff and students from Hawaiʻi Community College and UH Hilo (see list of UH Hilo dancers above). The hālau performed a free, one-hour show and will also be performing at the Smithsonian Folklife Festival on the National Mall starting Wednesday, June 27. Adapted from UH System News reports about UH at the Smithsonian festival. 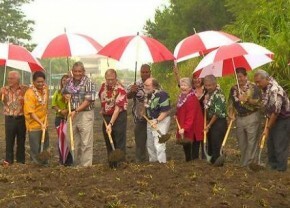 University and elected officials break ground on UH Hilo’s University Village. 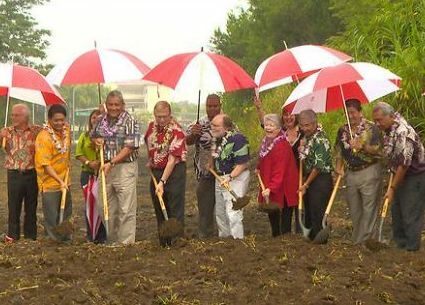 University of Hawaiʻi at Hilo held groundbreaking ceremonies today for the first phase of a new student housing complex. The University Village will be located on 33 acres fronting the university’s main entrance on Kawili Street and will feature approximately 300 student housing units in apartments and suite-style residence halls. Phase I of the University Village will be housed in a 105,500 square-foot complex occupying approximately five acres. The building will feature a trio of three-story residential wings comprised of two-bedroom units housing 302 students and a one-story common area that interlocks with two exterior courtyards. Other amenities will include a new parking lot and bike storage for residents. The governor signed a bill today supporting statewide research into beehives to be conducted by the University of Hawai‘i system. This includes research at UH Hilo’s farm laboratory to develop more efficient methods for controlling the small hive beetle. Attending today’s bill-signing ceremony at the Hawai‘i State Capitol are (l-r) Russell Kokubun, director of the Hawai‘i Department of Agriculture; Lauren Rusert, apiary technician, HDOA; Lorna Tsutsumi, professor of entomology, UH Hilo; Jacqueline Robson, apiary program planner, HDOA; Governor Neil Abercrombie; (behind the governor) Rockne Freitas, UH system vice president for student affairs and university/community relations; Danielle Downey, Hawai‘i state apiarist, HDOA; Donald Straney, chancellor at UH Hilo; Scott Enright, deputy director, HDOA; and Neil Reimer, plant pest control manager, HDOA. 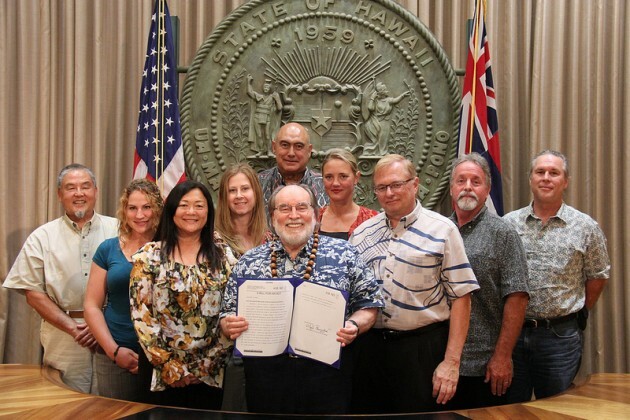 At ceremonies at the Hawai‘i State Capitol today, Governor Neil Abercrombie proclaimed this week Hawai‘i Pollinator Week and signed a bill into law that appropriates funds to the University of Hawai‘i for statewide beehive research. UH Hilo Chancellor Donald Straney attended the signing along with UH Hilo Professor of Entomology Lorna Tsutsumi, UH Vice President Rockne Freitas and officials from the Hawai‘i Department of Agriculture. A total of $30,000 in funds will be allocated as follows: $5,000 each for Hawai‘i county, Maui county, the city and county of Honolulu, and Kaua‘i county; and $10,000 to UH Hilo’s College of Agriculture, Forestry, and Natural Resource Management. HONOLULU – In an effort to raise awareness of a threat within the State’s agricultural economy, Governor Neil Abercrombie this afternoon proclaimed June 18-24 as “Hawai‘i Pollinator Week.” Governor Abercrombie also signed into law a measure that will aid Hawai‘i’s fight to control pests and diseases that have been impacting the state’s bee populations. House Bill 2100 appropriates $30,000 to the University of Hawai‘i (UH) system for bee hive research done in consultation with the Hawai‘i Department of Agriculture on Hawai‘i Island, Maui, O‘ahu and Kaua‘i. This will include work being performed at UH Hilo’s 110-acre Panaewa farm to develop more efficient methods for controlling the small hive beetle, a major pest of honey bee hives on Hawai‘i Island. Hawai‘i Pollinator Week coincides with National Pollinator Week to raise awareness of the issue of declining pollinator populations. In Hawai‘i, there has reportedly been significant hive loss attributed to the Varroa mite, small hive beetle and diseases. Loss of bee hives is a threat to the agricultural economy on all islands because bees are necessary to pollinate many crops. UH Hilo has been offering an introductory course on beekeeping for more than 20 years, and now also offers an advanced beekeeping course that allows students to build upon their acquired skills with independent projects that include research and creative activities.